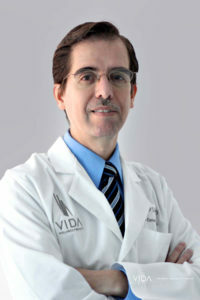 Juan Carlos Fuentes, M.D., brings a variety of specialties and expertise to the team at COSMED. He attended the University of Guanajuato in 1989 and graduated first in his class. After interning in Mexico City at the Instituto Nacional de la Nutrition, Dr. Fuentes continued his studies in General Surgery. He completed a successful plastic surgery residency program at Centro Medico Nacional de Occidente in Guadalajara, Mexico, where he received the title of Chief of Residents. Dr. Fuentes excelled during his post-graduate fellowship, which focused on Aesthetic and Cosmetic Surgery. Dr. Fuentes worked under the direction of Dr. Bruce F. Connell, a noted international teacher of aesthetic surgery techniques and clinical professor at U.C.I. As a board certified member of the Mexican Board of Plastic, Aesthetic and Reconstructive Surgery, Dr. Fuentes has also completed extensive fellowship training at Southwestern Medical Center and Texas University in Dallas. He currently serves as a member of the International Society for Aesthetic Plastic Surgery (ISAPS), the American Society of Aesthetic Plastic Surgery (ASAPS), and the San Diego Plastic Surgery Society.